Welcome to Northeast Alabama Community College. The mission of Northeast Alabama Community College is to provide accessible quality educational opportunities, promote economic growth, and enhance the quality of life for the people of Alabama. The Northeast Alabama Community College Department of Music will present "I've Had the Time of My Life: A Totally 80s Prom Night" on Thursday, May 9th at 6:00 PM in the Tom Bevill Lyceum on the NACC campus. The concert will feature the NACC Jazz Band, Chorus and Encore! “This will be a totally awesome evening that will have you ‘Walking on Sunshine!’," promises Vocal Ensembles Director Sara Markham. "We are ‘Head Over Heels’ for this music, and we know that it will have you ready to party ‘All Night Long’! We hope that you'll be ready for ‘Dancing in the Dark’, because ‘We've Got the Beat’ that will make you want to ‘Get Into the Groove’!" Members of the Epsilon Alpha Chapter of Sigma Kappa Delta () at Northeast Alabama Community College (NACC) recently attended the Sigma Tau Delta/Sigma Kappa Delta National Conference in St. Louis, Missouri, March 27-31, 2019. Sigma Kappa Delta historian, Claire Lybrand, moderated and Paulina Landers,  treasurer, served on a panel entitled, “Grit Happens: Strategies for Discovering Your Potential.” The students attended breakout sessions and workshops on publishing their writing and finding careers as an English major. They also heard Nnedi Okorafor, Hugo and Nebula award-winning novelist of African-based science fiction, fantasy, and magical realism, as well as author of the comic book, Shuri: The Search for Black Panther. Accompanying the students were sponsors Jeff Hawes, Jody Ragsdale, and Joan Reeves. Awards Day at Northeast Alabama Community College (NACC) will be on Monday, April 29, 2019, at 10 AM in the Tom Bevill Lyceum on campus. Students will receive scholarships from four-year universities/colleges, and certificates and awards for notable service in campus clubs and activities. A reception will follow in the lobby of the Lyceum. The public is cordially invited to attend this awards ceremony and reception to help honor NACC students for their accomplishments throughout the year. You’ve heard the saying a dog is “man’s best friend” but how about a dog being a best friend to an entire college? Northeast Alabama Community College is considered “home” to many. Faculty, staff, students and friends of the college will tell you the college is a family environment. Northeast has become a special home to a very special dog named Roscoe. Roscoe has many friends on campus. You might see him hitching a ride with some of our maintenance staff or running along behind them in their service carts. You might see him escorting folks from building to building. You might see him greeting visitors while on campus tours. Most of the time you will find him at the Pendley Administration building, with his number one human, Dr. David Campbell, NACC President. Dr. Campbell, is known for having a huge heart for animals. Roscoe may be outside the building or sometimes in the President’s office, but he is always waiting patiently for Dr. Campbell’s arrival. Being around the two of them together, you will pick up rather quickly that Roscoe loves Dr. Campbell as much as Dr. Campbell loves Roscoe. On Thursday, April 11, the NACC Department of Music will present "Another Time and Place," a Sci-Fi/Fantasy concert featuring the NACC Concert Band, at 6 PM in the Music Auditorium of the William H. Beck Health & Fine Arts Building on the NACC campus. "This concert will be a real treat for movie fans and music fans alike! We hope you can come out," said Stacy Morris, Director of the Concert Band. 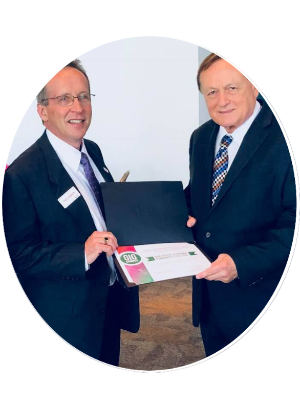 Mr. Fred Johnson (left on picture), CEO of Farmers Telecommunications (FTC), recently presented a certificate to Dr. David Campbell, President of Northeast Alabama Community College (NACC) certifying that NACC is a Gig Campus. NACC is the only college or university in Alabama that is Gig certified. Gig certification means that the college has gigabit-capable service access of broadband. NACC contracts with FTC and the Alabama Supercomputer Authority to provide this service for the college. This FTC partnership helps NACC provide extensive and advanced technology for students and staff, including more than 1,000 personal computers, some twenty-five computer laboratories, smart boards in all classrooms, a nursing simulation instruction laboratory, and an Apple Swift Coding laboratory. Through FTC, the college also was among the first in the state to provide total campus Wi-Fi.